Auto A/C Diagnosis… Quick, Easy and Guaranteed! Quick, easy and guaranteed? Can those terms all be used to describe anything that actually proves to be true? They can be if you’re talking about trying to determine if an A/C system is working at peak performance. It’s really an old trick that (surprisingly) isn’t used or understood by a lot of today’s technicians. But rest assured that once you understand it, you will use it every time. After all, it’s the laws of physics at work in your A/C system, and you just can’t fight the laws of physics. What’s the test? For lack of a better term, it’s just referred to as the “feel test.” What’s nice about it is that you already have the diagnostic tools required. It’s cheap. It’s accurate. It works every time…without fail. Above: Here's a look at the change of state of water. At sea level, these changes occur at these temperatures without fail. To understand the test, you have to understand what’s happening in the evaporator. Under proper conditions, high pressure liquid refrigerant, returning from the condenser, passes through the expansion device which in fact is just an “engineered” restriction in the system. Because refrigerant is pressure/temperature related, whatever we do to one, we automatically do to the other, correct? That means, simply reducing the pressure of the liquid refrigerant will cause the temperature to be reduced. The expansion valve (or orifice tube) does just that. It reduces the pressure of the high pressure liquid refrigerant making it low pressure, low temperature liquid refrigerant. The cold liquid refrigerant enters the bottom of the evaporator. Hot ambient air passes over the evaporator (forced by the blower motor). Because heat always transfers or moves from areas of high temperature to areas of low temperature (another law of physics), the heat from the hot air is absorbed by the cold liquid refrigerant. Above: Can you tell the difference between 32 degree ice and 32 degree water? Of course you can't. When the A/C system is working properly, this same principle applies to the cold liquid refrigerant and vapor refrigerant in the evaporator. There should NOT be a difference in temperature. Now, before we get too involved in what’s happening in the evaporator, let’s address one “side note” that is bound to come up. For the purpose diagnosing the A/C system, it’s really not important to understand exactly what the temperature of the cold liquid refrigerant is. Simply understand that it is much colder than the hot air passing over the evaporator but not so cold that it would cause the condensation forming on the evaporator to freeze. Therefore, for arguments sake, let’s just nail it down to being a temperature just above freezing: 32ºF (0ºC). In actual fact, the temperature is really a result of the refrigerant pressures, but that could turn out to be an entire different article. 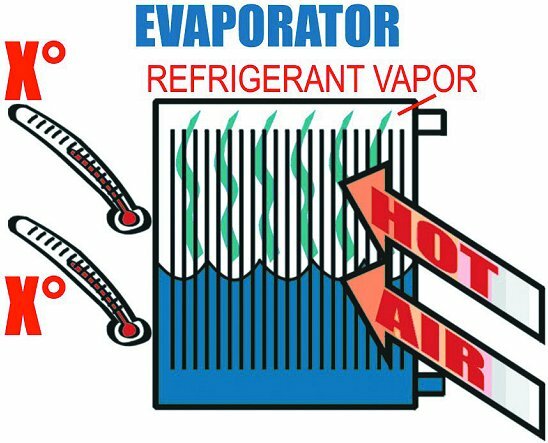 Above: In a properly working A/C system, the liquid refrigerant at the evaporator inlet absorbs heat and changes to a vapor (boils). The refrigerant vapor should be the same temperature as the liquid. Therefore, if they're the same temperature, you shouldn't be able to 'feel' a difference. So with cold liquid refrigerant in the evaporator absorbing heat from the hot air passing over it, what would you expect to happen to the liquid refrigerant? What happens is exactly the same as what would happen to a kettle of water on a stove top. Put enough heat into the water and it boils, correct? The exact same thing happens to the liquid refrigerant. Once it has absorbed enough heat from the hot air passing over the evaporator, the liquid refrigerant boils. It simply turns into a vapor and is then removed from the evaporator by compressor suction. 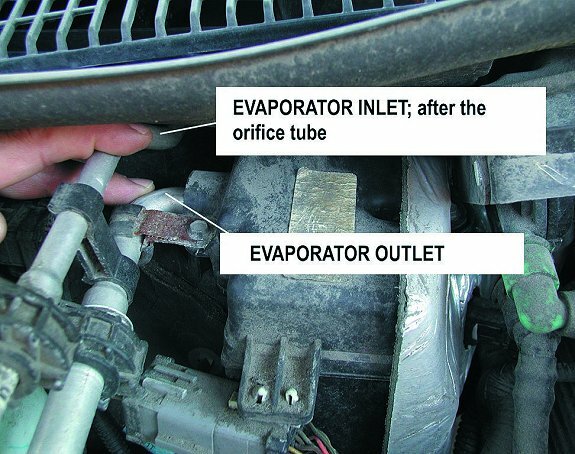 What is really important to understand now is how the temperature of the liquid refrigerant (evaporator inlet) relates to the temperature of the vapor refrigerant (evaporator outlet). Note that we’re not talking about the actual temperature of the refrigerant—we’re talking about how the temperature of the vapor relates to the temperature of the liquid. In other words, how do the temperatures compare to one another, or, what’s the difference in the temperature of the vapor and the temperature of the liquid? The short answer is this, if the system is working properly and at peak performance, there is no difference in the temperature of the vapor and the liquid. At least none that you can feel. 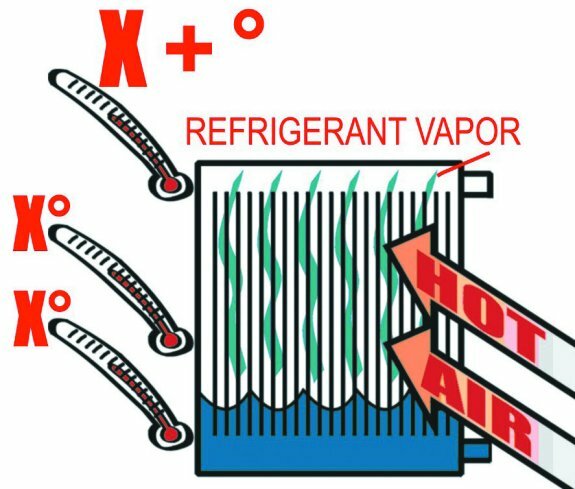 Above: Under a superheat condition, the cold refrigerant vapor continues to absorb heat from the hot air passing over the evaporator. The refrigerant vapor rises in temperature. NOW you can fee the difference in temperature between the evaporator inlet and outlet. To fully understand this, the physics have to be explained. There are a lot of different factors at work here and there is no real logical order to present them in, so you just have to follow along. The reward is that once you understand superheat, you really will understand the A/C system and how it functions. It’s just that simple (in the end). Above: Holding an ice cube in your hand causes your hand to get cold, right? That's because the laws of physics are at work. They stipulate that heat always travels from areas of high temperature to areas of low temperature. Of course, your hand is warmer than the ice cube. The entire issue about the “feel test” is really about understanding superheat. Superheat is a condition that will occur in the A/C evaporator for only one of two reasons: 1) either there is not enough refrigerant in the system, or, 2) there is a restriction in the high side (usually at the expansion valve or orifice tube or in the liquid line drier). Both low refrigerant charge or a restriction cause a low level of liquid refrigerant in the evaporator. The low liquid refrigerant level causes a superheat condition. Whenever there is a superheat condition, the A/C system is not performing or at least not to it’s maximum potential. In short, you have a problem. If you look up the term “superheat” in the dictionary, you’re going to get an explanation something like “to heat excessively” or “to heat a vapor not in contact with it’s liquid beyond it’s saturation point”. Ok, now that makes it clear, right? If not, then we have to dig a little deeper into the laws of physics and get to the bottom of this. The reverse of this is also true. If we take steam (vapor) and cool it or remove the heat from it, we can cause it to condense and “change state” back into water. If we continue to cool the water, it will “change state” once again and turn into ice. What temperatures do these changes occur at? Well, once steam is cooled below 212ºF (100ºC), it “changes state” and turns into water. Once water is cooled below 32ºF (0º), it “changes state” once again and becomes ice. All agreed? Good, let’s move on. So from what we already know about ice, water and steam, consider this. What is the warmest temperature ice can be? The warmest temperature ice can be is 32ºF (0ºC) because if we continue to heat it, it “changes state” and becomes water. Then consider what the coolest temperature water can be? The coolest you can get water is 32ºF (0ºC) because if you continue to cool the water it will “change state” and turn to ice. Understanding that, then what would the temperature of the water be that runs off melting ice? The temperature of the water running off the melting ice would also be 32ºF (0ºC). Remember, we’re heating the ice, not the water. The same holds true for the “change of state” from water into steam. What’s the warmest temperature water can be? 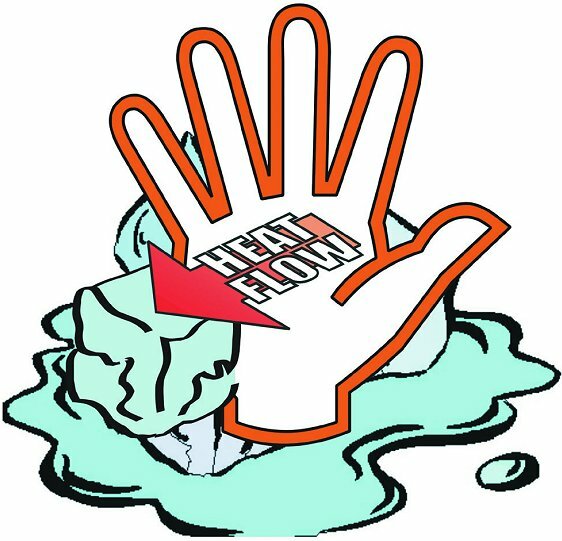 The warmest temperature water can be is 212ºF (100ºC) because continued heating of water will cause it to “change state” and become steam. Then consider what the coolest temperature you have steam at? The coolest you can get steam is 212ºF (100ºC) because if you continue to cool the steam, it will “change state” and condense back into a liquid. What’s the temperature of the steam (vapor) coming off the boiling water? The temperature of the vapor is 212ºF (100ºC) because it’s no longer being heated. The water was heated and changed state to a vapor. The vapor temperature remains the same as the water temperature 212ºF (100ºC). For the record, the term “latent” is from a Latin word meaning “hidden.” In other words, it can not be measured. The heat is said to disappear or become concealed. In fact, the true definition of “latent heat” is that the heat is concealed in a in a body while producing some change in it, other than rise of temperature. 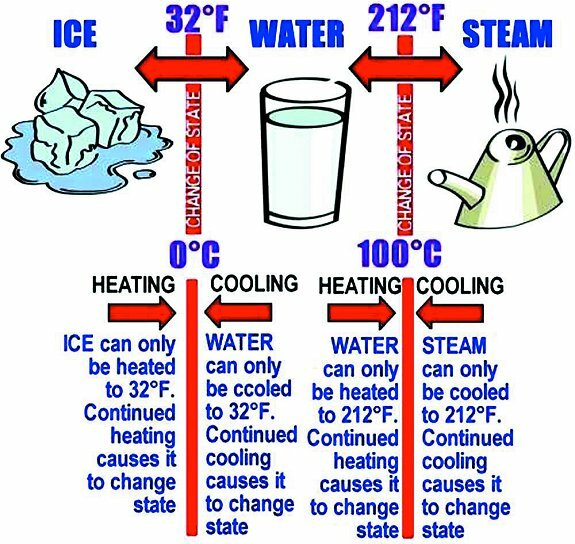 If we apply this to our previously used example of water and steam, we saw that we could only heat water to 212°F (100°C). Continued heating of the water caused it to change state to a vapor (steam). We also saw that the vapor (or steam) produced was 212°F (100°C). So what happens to the heat? The change of state to steam is “the change other than the rise of temperature” that consumed the heat. Therefore the heat can not be measured as it was “consumed to cause some other change, other than the rise in temperature.” The water would be at 212°F (100°C) and the steam would be at the same temperature. This is the principle of understanding the “feel test” and what makes it so exact all the time. Understanding the laws of physics, superheat and latent heat of transformation, it’s easy to see that the vapor refrigerant formed in the evaporator is the same temperature as the liquid refrigerant. That’s because all the heat was concealed or consumed to cause the change of state. The change of state is the change “other than the change in temperature” that is the basis of latent heat. Therefore, by using the “feel test,” all you are doing is confirming (by touch) that the liquid refrigerant at the evaporator inlet is the same temperature as the vapor refrigerant at the evaporator outlet. If that’s the case…then you’re done! The A/C system is working properly and at peak performance. There is no other test that is as reliable and true (not to mention cheap to do) than the “feel test.” Understand it. Use it. Rely on it. Because if your evaporator inlet and outlet feel the same temperature to your touch, and you still have a “no cooling” condition, then you have another problem in the controls, temperature blend door or air distribution. But you know your A/C refrigerant circuit is working perfectly. Above: Remember that in order to check a superheat condition in the evaporator, you are checking the DIFFERENCE between the temperature at the inlet and outlet. Be sure that you locate the orifice tube (where the dimples on the tube are) and you check the temperature AFTER that point. Now, understanding that, let’s have a look at what’s happening when the evaporator outlet (vapor) is NOT the same temperature as the evaporator inlet (liquid). First of all, you have a “superheat” condition. For those of you who remember A/C systems back in the 70’s, you will remember that GM A6 Compressors actually had a superheat switch mounted on the rear head. It was sensing a superheat condition (on the low side of the system) and when detected, it would blow the “thermal limiter” fuse causing the compressor to shut down. It’s been a while since the superheat switch was used, but it worked well, and it worked all the time. Just replacing the thermal limiter fuse would only lead to another blown fuse, of course, until the system was serviced. 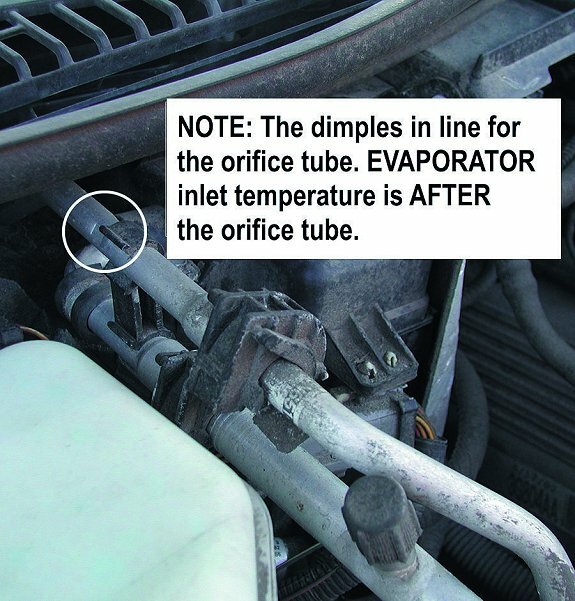 Above: Even if you can only get your fingers into the evaporator location, you can easily test the difference in temperatures between the inlet and outlet of the evaporator. They should both "feel" the same to your touch. If not, you have a superheat condition. Referring to a statement made earlier in this article, we said that a superheat condition only happens because of either a low refrigerant charge or a high side restriction (usually at the orifice tube, expansion valve or liquid line drier). In essence, what is really happening with either of those conditions is that they both lead to a low level of liquid refrigerant in the evaporator. That’s the root cause of the superheat condition; not enough liquid refrigerant in the evaporator. What’s happening in the evaporator when there is not enough liquid refrigerant? First of all, we know that the liquid refrigerant entering into the evaporator is low pressure and low temperature, so it’s going to be cold to the touch. Because the laws of physics are such that heat always travels from areas of high temperature to areas of low temperature, the heat from the air will be transferred to the cold liquid refrigerant. Ok, that’s the same on any A/C system working or not, correct? Yes, because the cold liquid refrigerant absorbs the heat from the air passing over it, it “changes state” and becomes a vapor. However, in the case where the level of liquid refrigerant in the evaporator is too low, the change of state to a vapor happens (for the lack of a better word) prematurely. It happens too quickly and the vapor remains in the evaporator. From our earlier explanations, we know that the cold liquid refrigerant “changed state” to a vapor, but the heat was “latent heat.” It was latent heat because it was absorbed to (or consumed to) cause some change other than the change of temperature. Additionally, we know that the vapor created is the same temperature as the cold liquid refrigerant, correct? Yes, but where is the cold refrigerant vapor? It’s still in the evaporator. If the cold vapor is at the same temperature as the cold liquid refrigerant, will it continue to absorb heat from the hot air passing over the evaporator? Yes, it most certainly will. Remember that the evaporator is a heat exchanger and designed to transfer heat. The cold vapor refrigerant still in the evaporator will absorb heat from the hot air passing over it. After all, the laws of physics state that heat will always move from areas of high temperature to areas of low temperature. Therefore, having hot air meeting cold refrigerant (vapor or liquid) means that the heat will transfer to the refrigerant in the evaporator. The problem is that the heat continues to be transferred to the vapor refrigerant, not just the liquid refrigerant. This continued heat transfer to the vapor results in a “superheat” condition. Now, in diagnosing an A/C system we said that when working properly, the cold liquid refrigerant at the evaporator inlet would feel the same as the cold vapor refrigerant at the evaporator outlet. However, now in this “superheat” condition, we have the cold vapor refrigerant continuing to absorb heat. What would the temperature of that vapor refrigerant be? Well, the actual temperature is not as important as the difference in temperature between the liquid (inlet) and the vapor (outlet). When the vapor refrigerant continues to absorb heat, it becomes warmer to the touch. Therefore, when the A/C system is under a “superheat” condition, the evaporator outlet will “feel” warmer than the evaporator inlet. Why? Simply because the refrigerant vapor has continued to absorb heat from the hot air passing over the evaporator. Peter Sosinsky's background in auto A/C spans over 25 years. He is also a contributing writer for auto A/C service eBooks, which are available online at www.autoACsystems.com.